I make these almost every Saturday morning and they are by far my favorite! 1. Mix together spelt flour, rolled oats and baking powder. 2. In a separate bowl, mix together milk and vanilla extract. 3. Once well mixed, pour wet ingredients over try ingredients and mix together. 4. Pre-heat a non-stick skillet on med-high heat. 5. I use a small measuring cup to scoop out batter to make pancakes. 6. 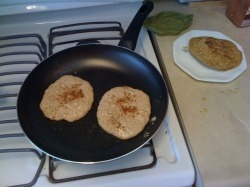 Once you've put some batter in the skillet, sprinkle the wet side of the pancake with cinammon. 7. When edges start to dry and pancakes bubble, flip to the other side (each side is about 2-4 min, depending on how hot your skillet is. You can have these with syrup (make sure there is no high fructose corn syrup in your syrup), pure maple syrup, or cover with fruit. I love blackberries over my pancakes! !